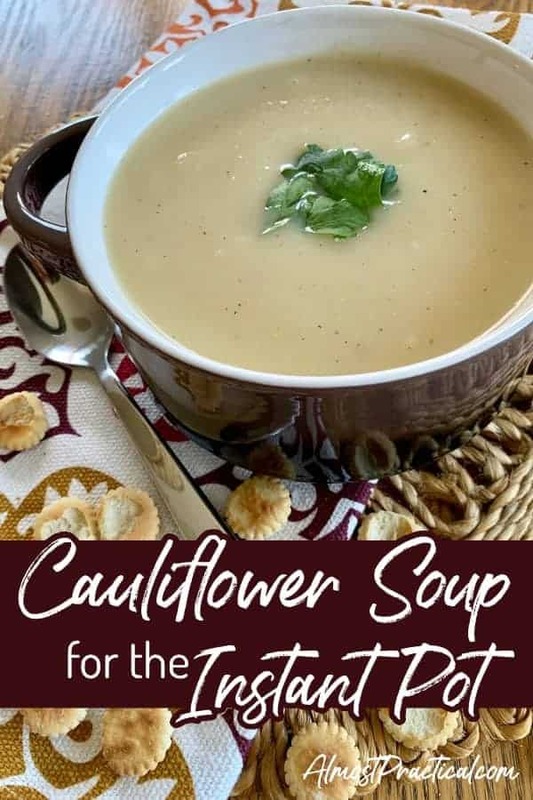 This Instant Pot cauliflower soup recipe could not be any easier. It is my fallback when we are short on time and goes great with a grilled cheese sandwich. 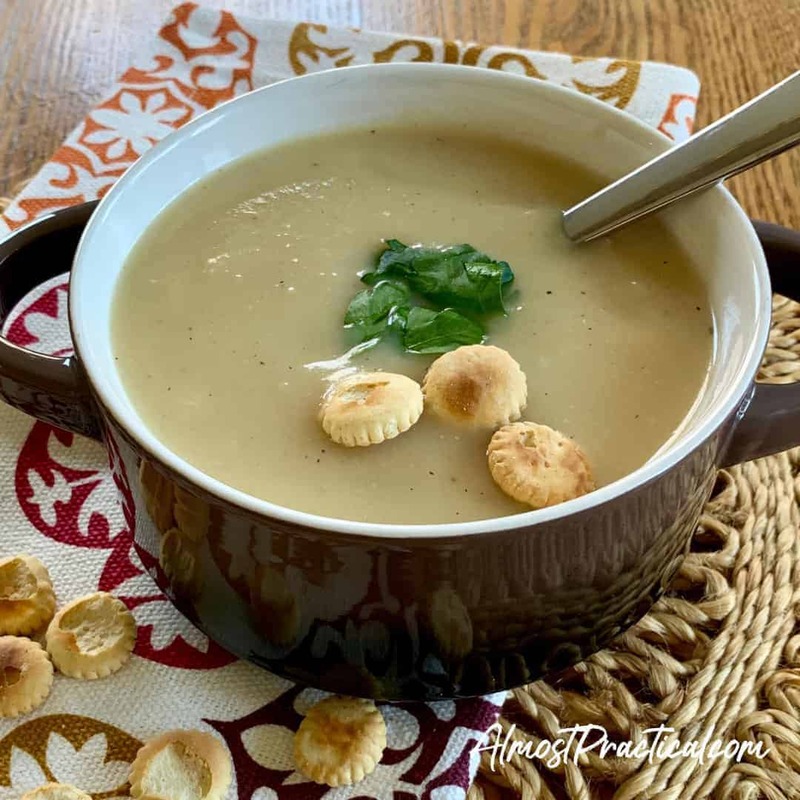 The creamy texture comes from a potato, of all things, so this soup is also dairy free, and if you use vegetable broth instead of the chicken broth – it can be vegan as well. 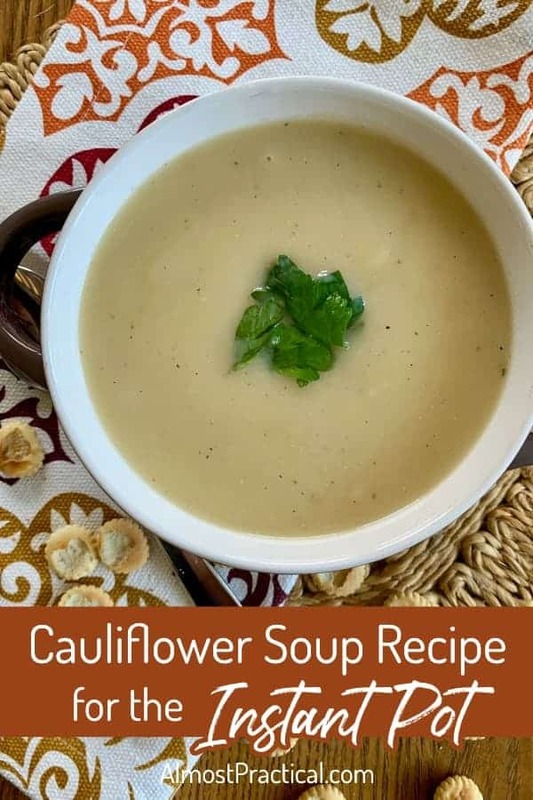 But perhaps most importantly, my kids love this cauliflower soup recipe – or should I call it cauliflower potato soup? It's a delicious way to get more vegetables into your diet – and that is what really matters. 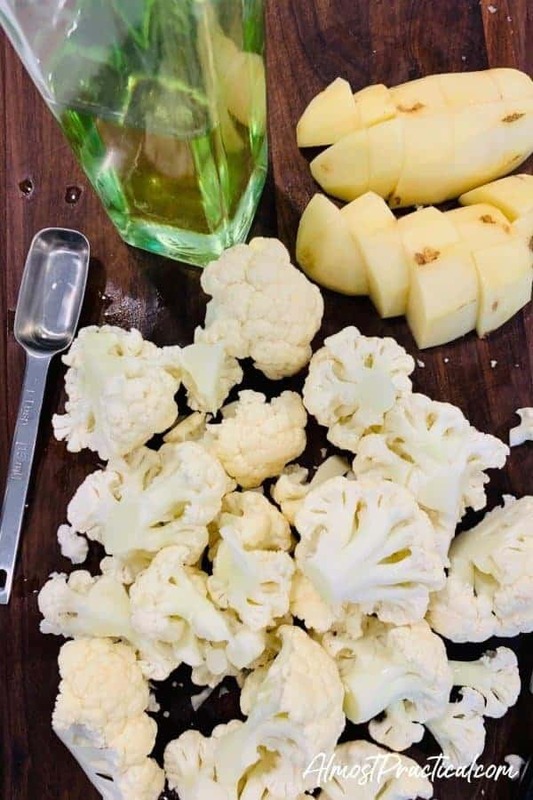 For this recipe, I first wash all the vegetables and peel and cube the potato. 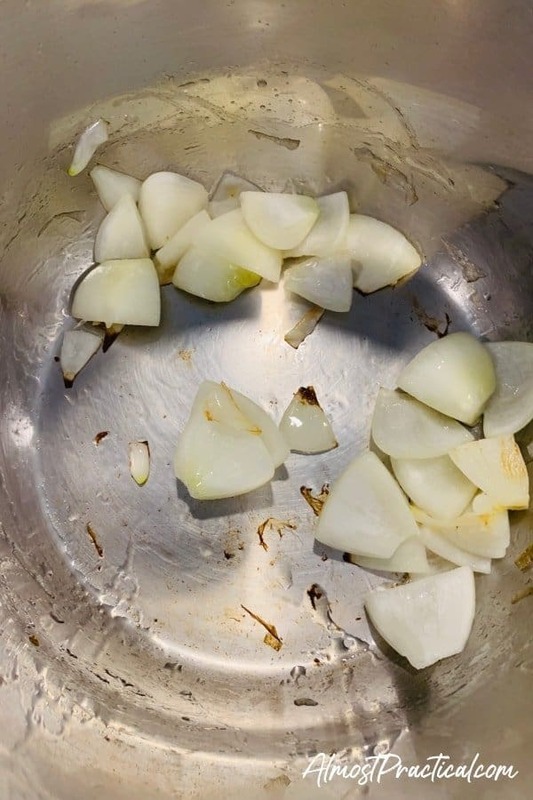 Then I peel and cut the onion into quarters. 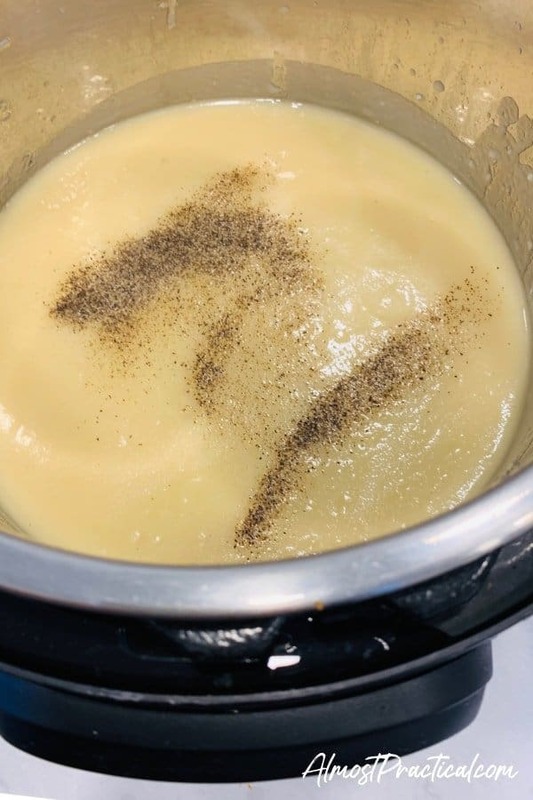 Put the Instant Pot on the sauté setting, add a tablespoon of canola oil to the inner pot, and toss in the onion so that it can start to soften. 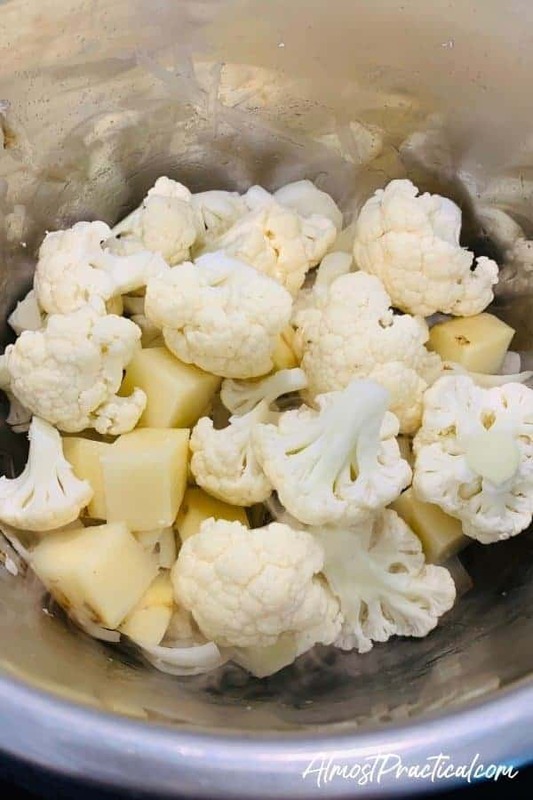 While you sauté the onion (make sure to stir so it doesn't stick), cut up the cauliflower into large florets. There is no need to chop anything finely because you will be blending everything with your immersion blender at the end. 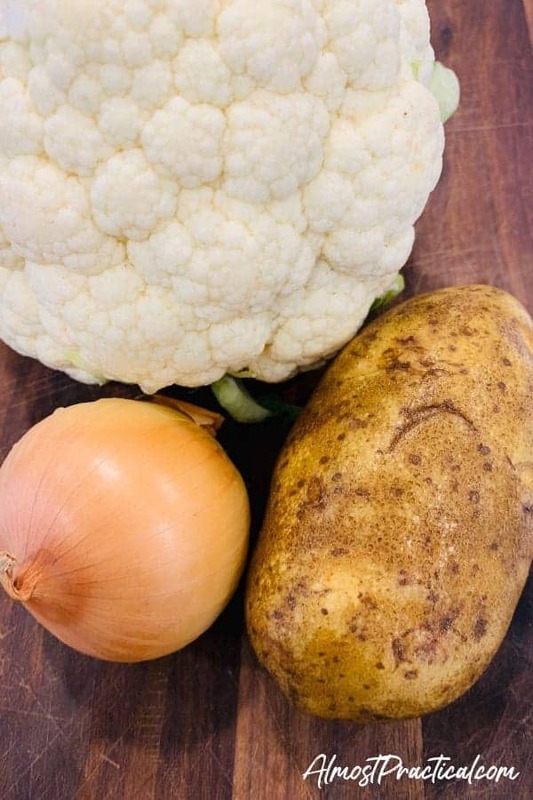 Now toss in the cauliflower florets and the cubed potato. Add about 4 cups of low sodium chicken broth. 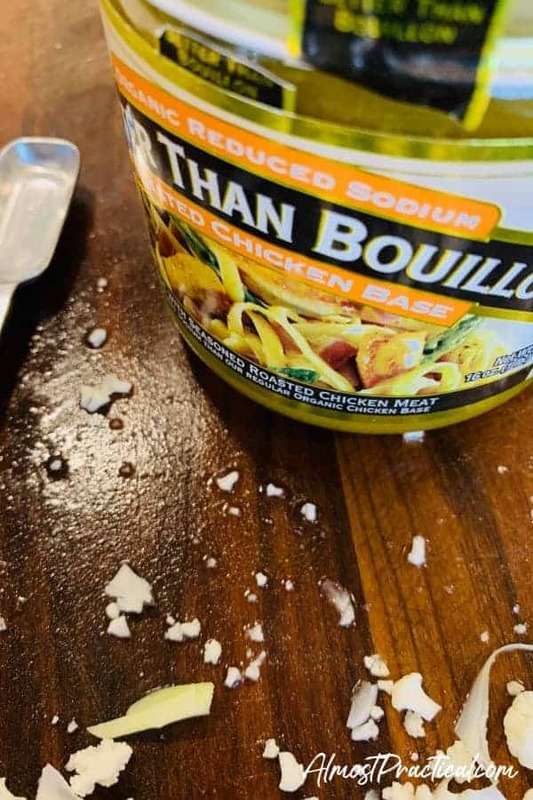 I actually use Better Than Bouillon – so I just add 4 cups of water and 4 teaspoons of the Better Than Bouillon product instead of the broth. But you can do either – just don't do both. Now, cancel the sauté function on the Instant Pot. Close and lock the lid with the valve in the closed position. 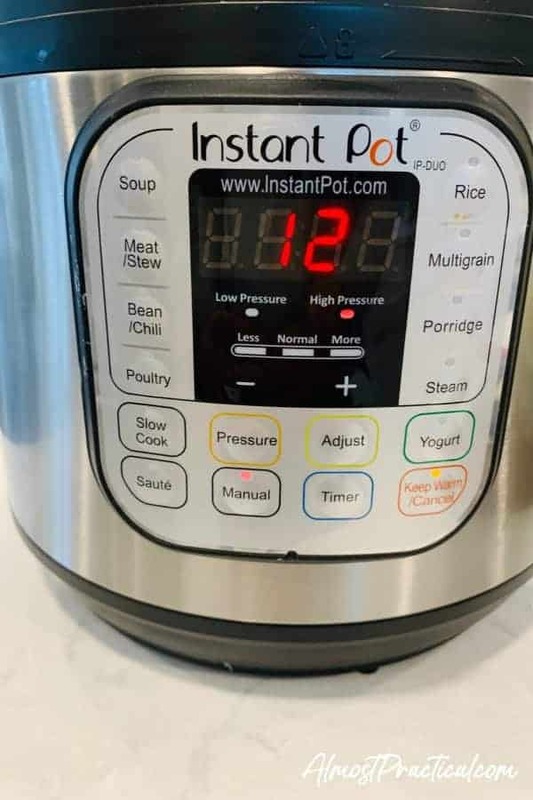 Set the Instant Pot to Manual and cook at high pressure for 12 minutes. When the time is up, turn off the keep warm function and let the pressure drop naturally. The vegetables should be super soft and cooked through. 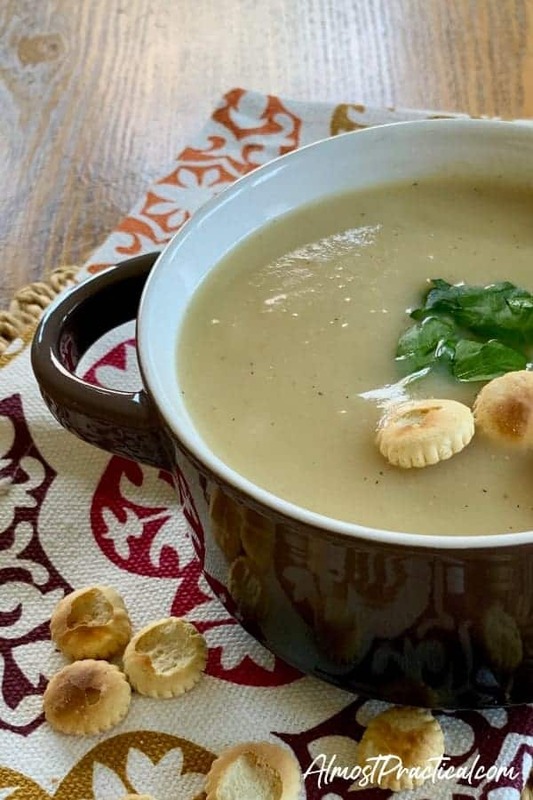 Use your immersion blender to blend the Instant Pot cauliflower soup to a smooth consistency. Add salt and pepper to taste. (I use about a half teaspoon of ground black pepper and about three quarters teaspoon of salt). When it comes to using ingredients made by Mother Nature, I hesitate to give exact quantities. 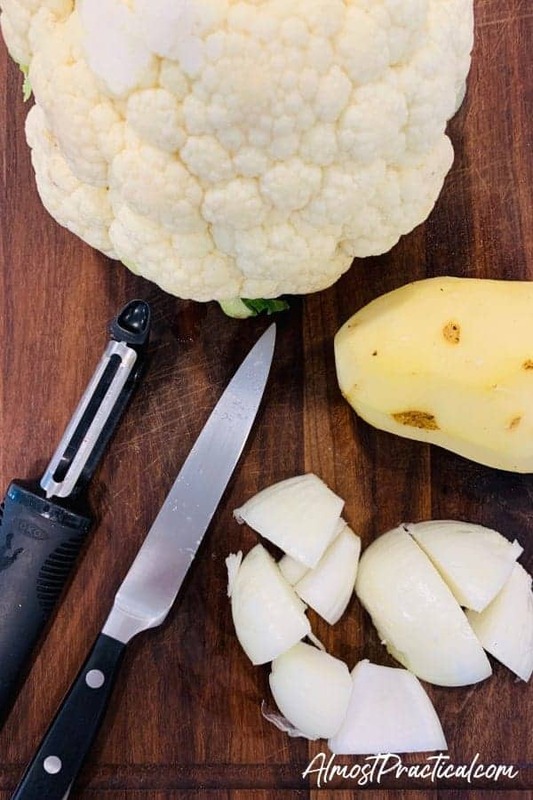 One head of cauliflower can vary quite a bit in the exact cups that it makes when all cut up. In fact, the way you cut it makes a difference too. 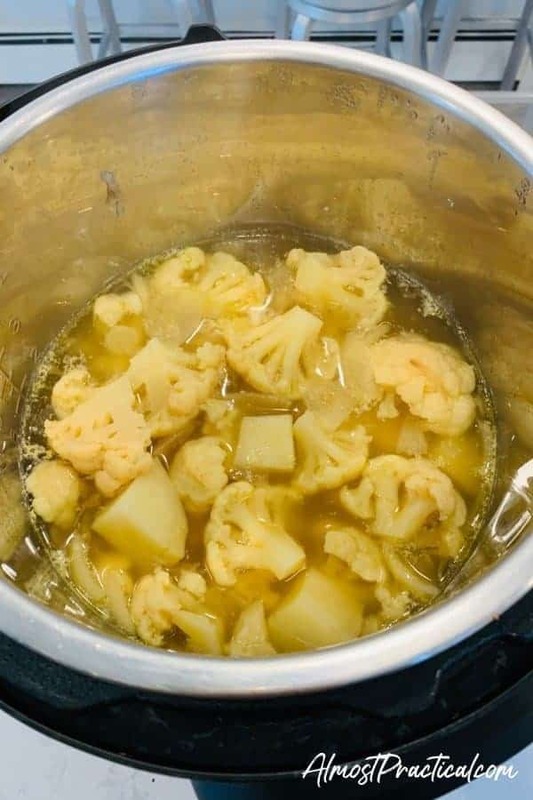 So, it is easier just to go with the more general – one head of cauliflower, one russet potato, one onion etc. 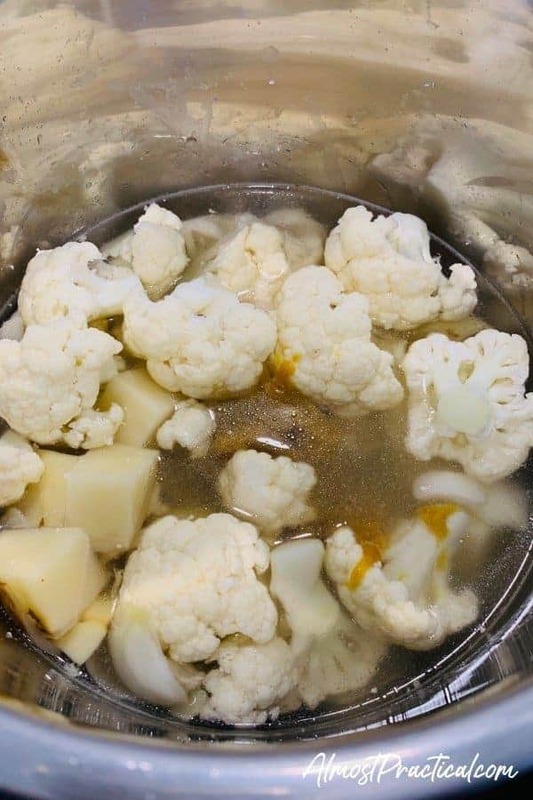 If your vegetables are largish then increase the broth and seasonings a little – but for the most part, everything should come together well. Wash all the vegetables and peel and cube the potato. Add 4 cups of low sodium chicken broth. Cancel the sauté function on the Instant Pot. When the time is up, turn off the keep warm function and let the pressure drop naturally. Then open lid, when safe to do so. The vegetables should be soft and cooked through. Add salt and pepper to suit your taste.